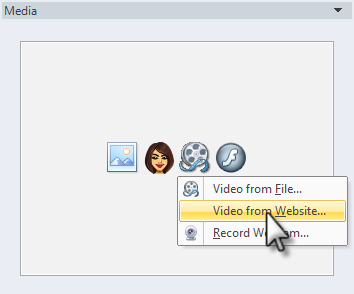 With Articulate Engage, you can enhance your interactions with videos from any of three sources: video files, websites, and webcams. We'll take a look at each method below. Note: Videos will be synchronized with the interaction. To add an interactive SWF file that plays independently, insert it as a Flash movie instead. Select the step where you want to insert a video. Click the Video icon in the Media panel on the right side of the screen. (Note: For Media Tour interactions, the Media panel is in the middle of the screen.) Select Video from File. Browse to the video you want to use, and click Open. After inserting a video, you can preview it using the Play/Pause and Stop buttons below the video thumbnail. Engage makes it easy to embed videos that are hosted on popular websites such as Screenr and Vimeo. Note: As of May 2015, Google no longer allows YouTube videos to be embedded in this manner; however, YouTube videos in existing interactions will continue to work. For new interactions, we recommend using a different video hosting service or importing the source video files directly into your interaction. Click the Video icon in the Media panel on the right side of the screen. (Note: For Media Tour interactions, the Media panel is in the middle of the screen.) Select Video from Website. Copy the video embed code from the hosting website, and paste it into the Insert Video From Website box. 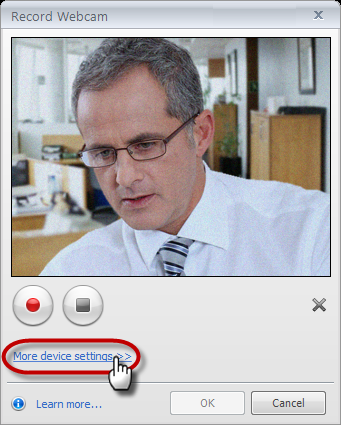 After inserting a website video, you can preview it using the Play/Pause and Stop buttons below the video thumbnail. Click the Video icon in the Media panel on the right side of the screen. (Note: For Media Tour interactions, the Media panel is in the middle of the screen.) Select Record Webcam. 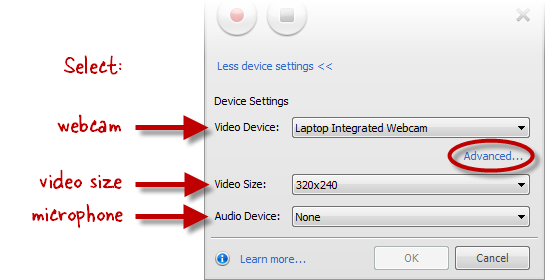 Use the Video Device drop-down to select the webcam you want to use. 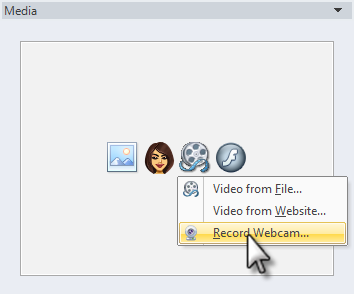 Click the Advanced hyperlink to fine-tune your webcam properties. Use the Video Size drop-down to select the dimensions for your video. 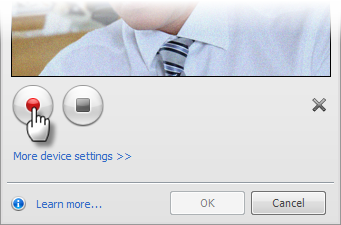 Use the Audio Device drop-down to select the microphone you want to use. 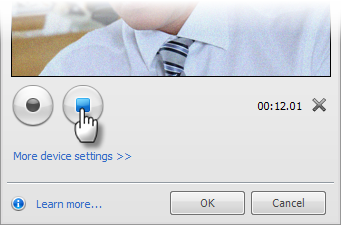 Then click the red Record button to begin recording. 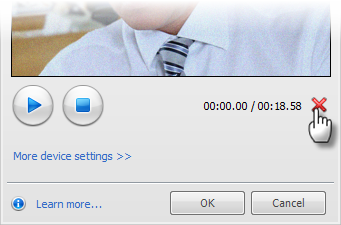 If you'd like to preview your recording before inserting it into your interaction, click the Play button. 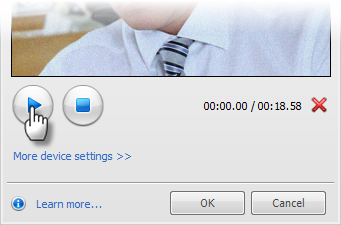 If you'd like to redo your recording, click the red X to delete the current recording. Then click the Record button to start over. When you're ready to insert the recording into your interaction, click OK.
After inserting a video, you can preview it using the Play/Pause and Stop buttons below the video thumbnail in the Media panel.